You find yourself on an industrial desert looking at your digital shadow as a cloud of radio noise. When you jump the whole scene freezes and you can watch your freezed body gesture as a floating iron sculpture while the camera turns around you in 360 degrees. The inspiration came from the well-known scene of the Matrix film where Trinity jumps and the time freezes while the camera turns around. 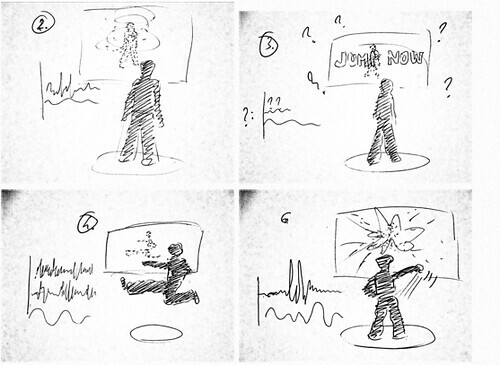 This was one of the first applications of bullet time effect in cinematography. This effect enhances the perception of a single moment. It enables the viewer to freeze the scene, and navigate in space while the time is stopped. 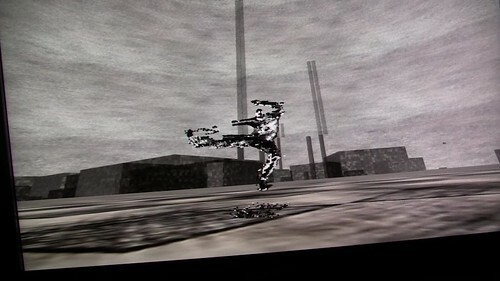 Reconstruct Trinity Kick is an interactive installation which captures your body in 3D when you jumped. When you jump the program detects and scans your body in 3D using two Kinect sensors. This happens only in a short moment and you can see your 3D image with the frozen jumping motion turning around in 360 degrees. This simple interaction enables users to reconstruct their own versions of ‘Trinity kicks’.